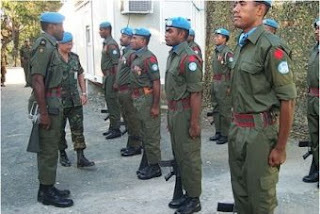 A contingent of peacekeeping soldiers has left Fiji, bound for duties on the Golan Heights between Israel and Syria. A total of 318 troops are being airlifted this week to join the 182 Fijian soldiers already in place. A group of civilian doctors and nurses is also joining the troops for the first time to help man the United Nations hospital in the area. Land Forces Commander of the Republic of Fiji Military Forces, Colonel Mosese Tikoitoga, told Radio Australia's Pacific Beat program the civil war in Syria and the presence of rebels in the area facing the UN peacekeepers could make this mission different from previous ones. "It's an unprecedented situation," he said. "The rebels are winning one week, the government is winning another week, and there are no protocols for it." Colonel Tikoitoga says it is unlikely the group will the target of serious violence as no parties want to be seen antagonising peacekeepers. But Professor Barry Rubin, director of the Global Research in International Affairs institute, says the Fijians face potential threats from both sides of the Syrian conflict. "As Western help for the rebels builds, it gives incentives for the regime to look at these peacekeepers as enemies and to see them as basically people who want to overthrow the regime," he said. "(On the other side) there are people who just wonder what are these non-Muslims doing here, they want to stop the revolution." Colonel Jone Baledrokadroka, a former Land Forces commander in the Fiji Army, says Fiji's ties with Russia in organising the deployment will also pose a risk to Fijian troops. "We know that Russia has sided with the Assad government, with Syrian forces," he said. "Word will get out that the Fiji troops have been assisted by the Russians. "Fiji will actually be tainted as being sort of siding with the Russians."